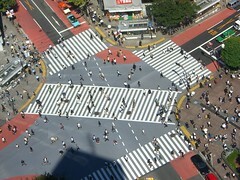 Supposedly the busiest pedestrian crossing in the world outside of the Hachiko exit of Shibuya station, Tokyo. During peak hours several thousand people a minute cross the street here. If you look closely you'll see a lot of the women with parasols to protect them from the sun.